Knitter's Pride Bamboo needles feature a high tensile strength, are lightweight, strong and flexible. 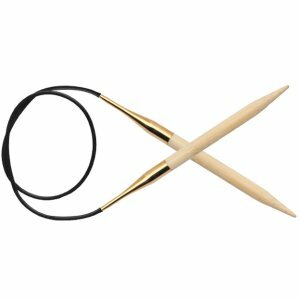 Made from the finest bamboo with a fabulous, smooth finish, these needles have 24 Karat gold plated connectors, flexible cords that lay flat with no kink or twist, and have a smooth join that ensures easy stitch gliding with no snagging as you knit. Addi Rocket Squared Needles and Knitter's Pride Zing Fixed Circular Needles are both similar needles: 32" (80cm), circular, and US 9 (5.5mm) US size. You may enjoy taking a look at the , and Malabrigo Arroyo Fly Forward Shawl kits all using Knitter's Pride Bamboo Fixed Circular Needles.